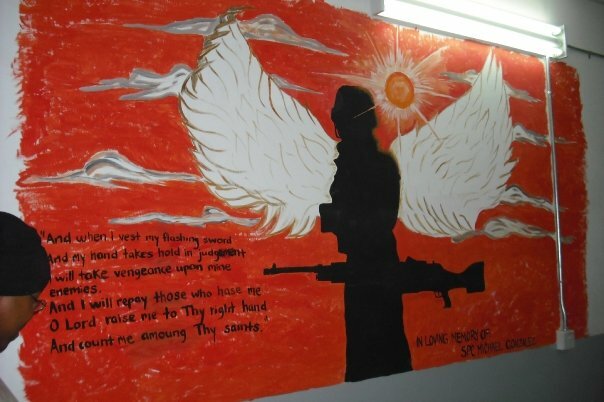 This is a mural that was painted on a wall in Iraq in memory of Michael by Liza Ruiz.. 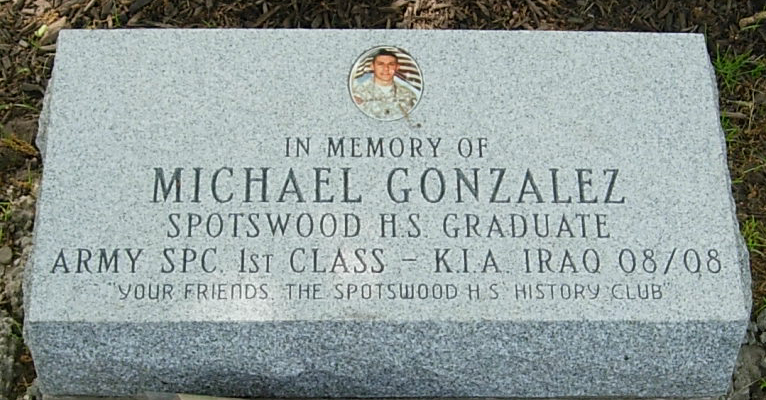 Hometown: Spottswood, New Jersey, U.S.
Died: August 28, 2008 in Operation Iraqi Freedom. Unit:Army, 340th Military Police Company, Fort Totten, NY. 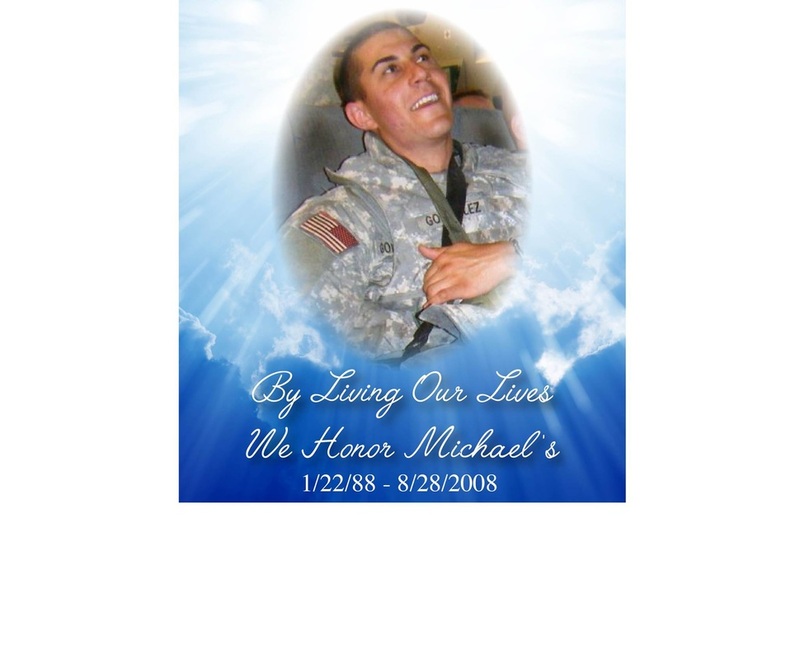 MY HERO, SPC MICHAEL L. GONZALEZ.on Sep30by Herobracelets | Print the article |My Story.. I do not know where to start.. I have so much to say.. I am the Proud Mother of Spc. Michael L Gonzalez. We received our hero bracelets from a family memeber. Then I needed to get more for all of my family and friends. When I seen where the donations go to I even wanted to donate more. How do I tell the world how proud I am of my son. That I do not blame United States of America, Michael or God.. it was Michael’s destiny to be in Iraq fighting for his country.. for peace on earth. 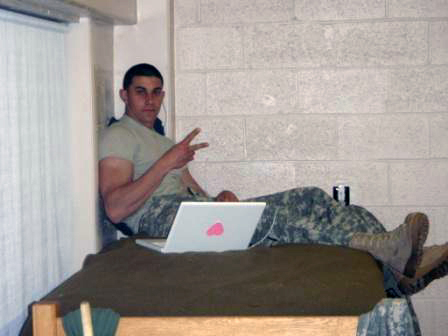 When Michael decided to join the Army I as a mother was against it I told him military is good if there is no war. He told me mom this is what I want to do. He wanted to be a policeman and he figured joining the military was the best way to get there fast. Michael called his NCO all the time to see when he could go. He got orders twice before and both times they sent him back what a releif. Then he got his 3rd set of orders in March, he was to be in Fort Totten, NY to leave for training in Fort Dix the end of March. When we brought him on Saturday which was the day that they explained to the families all the things they needed to know about deployment. He was not even on their roll call list, I said ok lets go Michael. I was so worried he didn’t really know anyone except two others from his the 430th.his home unit. They left for Fort Dix for training on Sunday and since that was in NJ he was still close to home, only 45 minutes south of us. We did visit him a few times when he was there he would call at 8PM and say I have free time can you come get me.. So off we went so we can be with our son.. On June 20th he had his 4 day leave before he went to Iraq. We had a going away party for him, I am so thankful that the people who cared so much for Michael were able to make it. We said a few things and wished him well that when he came home he would even have a bigger party. 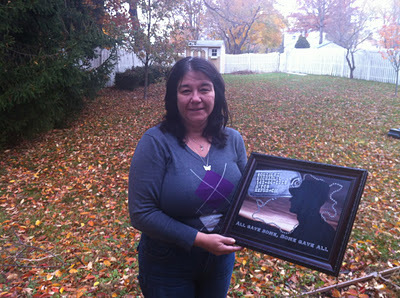 We took him back to Fort Dix on Monday June 23rd, the day before my birthday. For my birthday he made sure I had a computer camera. When he got to Kuwait he called to let us know he got there ok. I believe he was in Kuwait for 2 weeks, then off to Rustamiyah. I was able to chat with Michael online almost everyday. Thank heavens for internet access which he paid $55 a month for to me it was worth every penney. I spoke with him on the phone once, and the Friday before he died he left a message for us. I hold on to that with all my heart. On Wednesday Michael was talking to Tiffany on the phone, she heard loud noises. When he went to his bunk buddy he was having a seizure, Michael saved his life.. I didn’t know that and I was looking for him online to see how the other solider was. He wasn’t online. We went about our lifes because my husband was home on Thursday 8/28/2008. I needed a few things from the grocery store and when I went out of the corner of my eye I seen someone walking up the sidewalk. When I turned to look it was two military personal dressed in there dress greens. I knew then and there what they were going to tell me..
Spc. 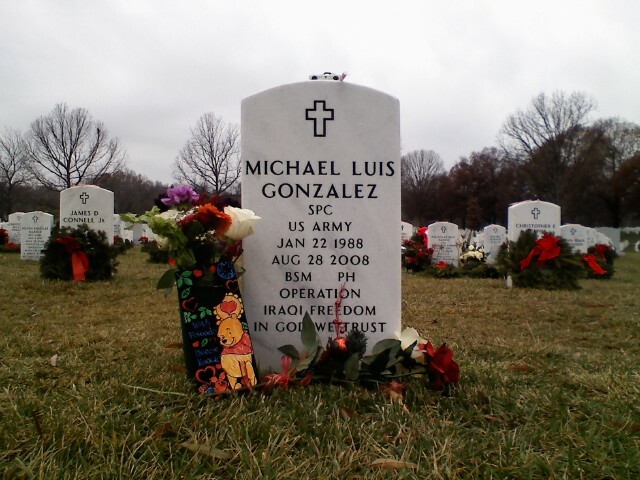 Michael L Gonzalez was killed in action 8/28/2008 … We miss him dearly… HE IS OUR HERO.. WHEREAS, Michael L. Gonzalez a citizen representing our community who was called to arms as soldier in the endeavor to protect and serve, and who possessed all the great virtues of Honor, Courage, Selflessness, and Sense of Duty to his Community and Country will be dearly missed by all of us. NOW, THEREFORE, BE IT RESOLVED I, Thomas W. Barlow, Mayor, do hereby proclaim the 2009 National Night Out in Memory of MICHAEL L. GONZALEZ, Honorary Police Officer of the Borough of Spotswood, and call upon all our citizens to make every effort to express our appreciation to Michael against all who would violate the law. NOW THEREFORE, BE IT AND IT IS FURTHER RESOLVED that this Mayor and Council, speaking on behalf of the entire Community, mourn Michael's loss and extend to his family our sincere sympathy in this hour of their bereavement.